Witton Albion 1 Warrington Town 2, 26/12/2017. Wincham Park, Northern Premier League. 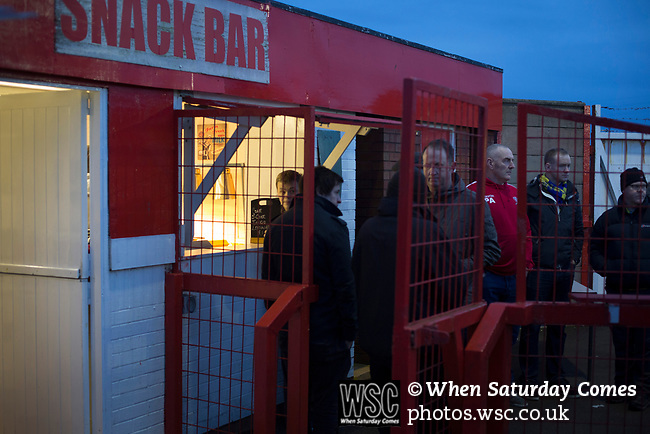 Spectators at the snack bar watching the second half action at Wincham Park, home of Witton Albion (in red) during their Northern Premier League premier division fixture with Warrington Town. Formed in 1887, the home team have played at their current ground since 1989 having relocated from the Central Ground in Northwich. With both team chasing play-off spots, the visitors emerged with a 2-1 victory, the winner being scored by Tony Gray in second half injury time, watched by a crowd of 503. Photo by Colin McPherson. Restrictions: NO USAGE OF THIS IMAGE WITHOUT PERMISSION. Available for syndication on request, subject to agreement with WSC and any licence restrictions. Please see our terms and conditions for details.